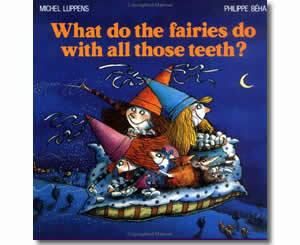 Kids Dental Health Books - What Do the Fairies Do With All Those Teeth? Home > Holidays > Dental Health Month > Kids Books > What Do the Fairies Do With All Those Teeth? Product: What Do the Fairies Do With All Those Teeth? Just what do the fairies do with all of those tiny teeth they collect? Surely this is a standard question any parent needs to be ready for. Michel Luppens' story, illustrated by fellow French-Canadian Phillippe Beha, offers many fun possibilities - perhaps they make necklaces, or put them inside maracas, construct sets of false teeth, pulverize them to make star dust. Surely, your child will think of additional uses as they read the story.